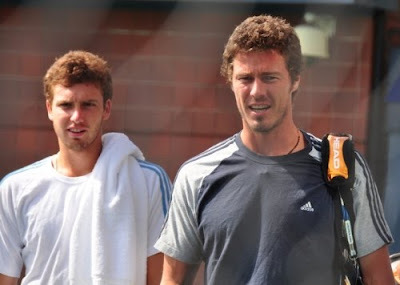 Latvian press reported that Ernests Gulbis has hired Hernan Gumy as his coach. Looks like Gumy will not be out of job after Marat Safin retires at the end of the season. Roger Federer was slapped with a $1,500 fine for using profanity while arguing with a chair umpire during the US Open final. A total of $31,500 is being collected by the season ending grand slam for audible obscenity, including a large portion of $10,500 from Serena Williams. Anna Kournikova was reportedly two months pregnant with Enrique Iglesias’ baby after pulled out from the Malibu Triathlon last weekend. More endorsement deal for American Melanie Oudin. She has just signed a deal with Air-Tran Airways Limited, which is based in her home state of Georgia. Rumours have been circulating that the French Open may be considering a move to Disneyland Paris. However this have been downplayed but not dismissed by French Open tournament director Gilbert Ysern. Hot-looking player Nicolas Lapentti could put his retirement on hold if Ecuador wins its Davis Cup tie against Brazil this weekend and secures a place in next year's World Group. Kim Clijsters will begin next season at the WTA event in Brisbane a tune-up tournament before the Australian Open.